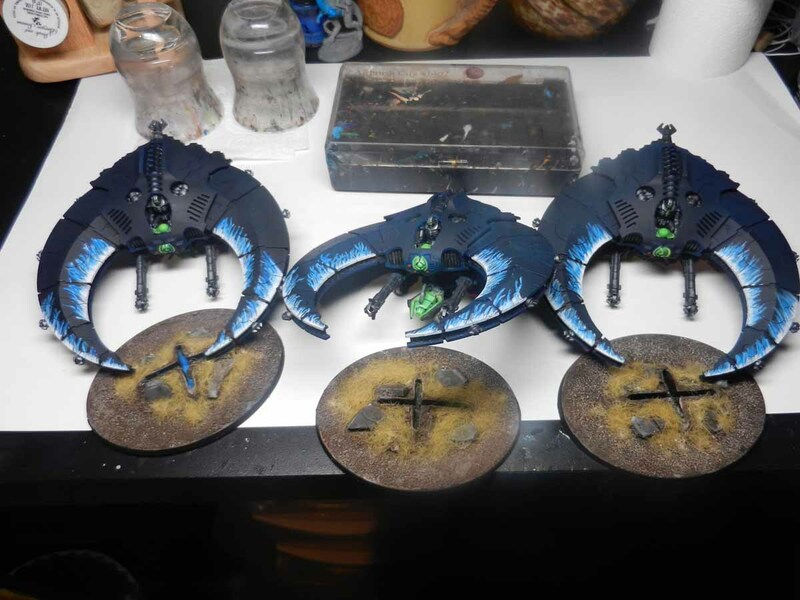 I mentioned a couple of posts ago about making the flight stands for the Necron Scythes removable using Sugru, a somewhat flexible self curing putty/rubber. I’ve been using this stuff to fix just about everything around the house since I ordered it. 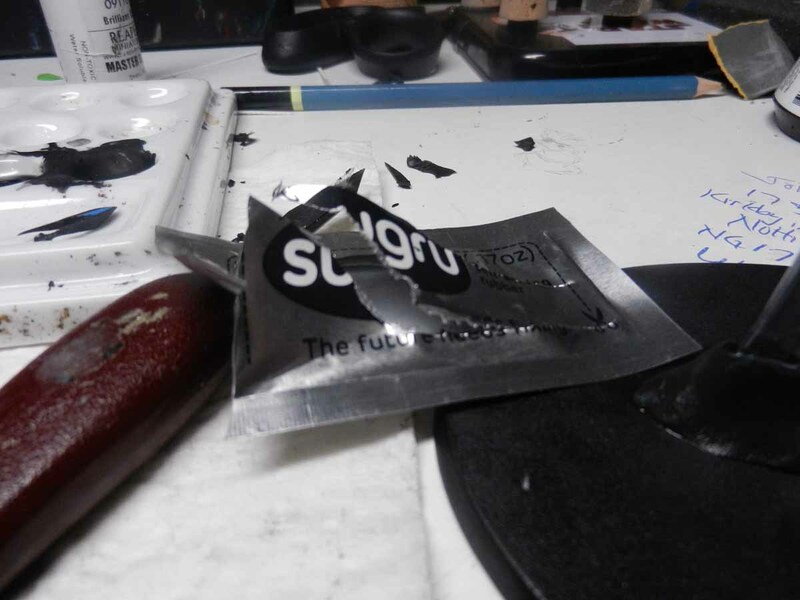 I used about two mini packets of Sugru per base. 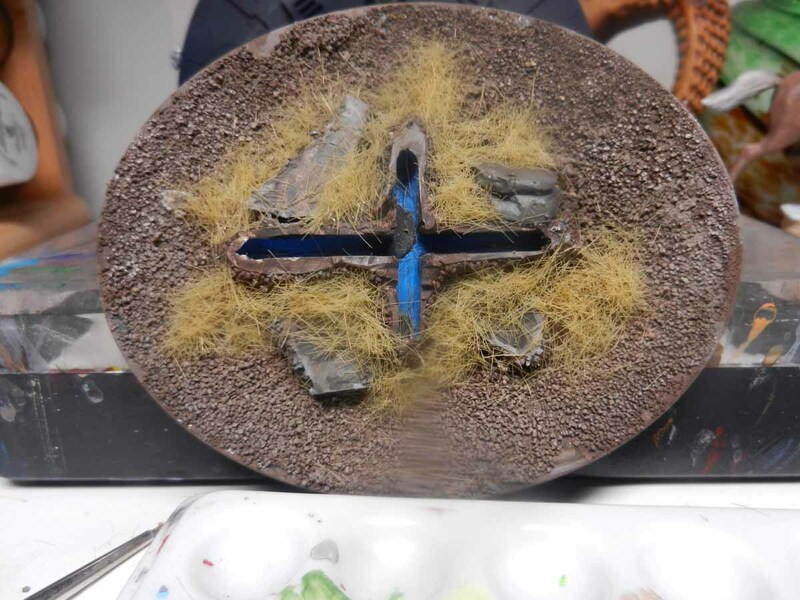 Now that I have some experience with the material, I think less could be used on future projects. Sugru will stick to just about any porous and some non porous materials. 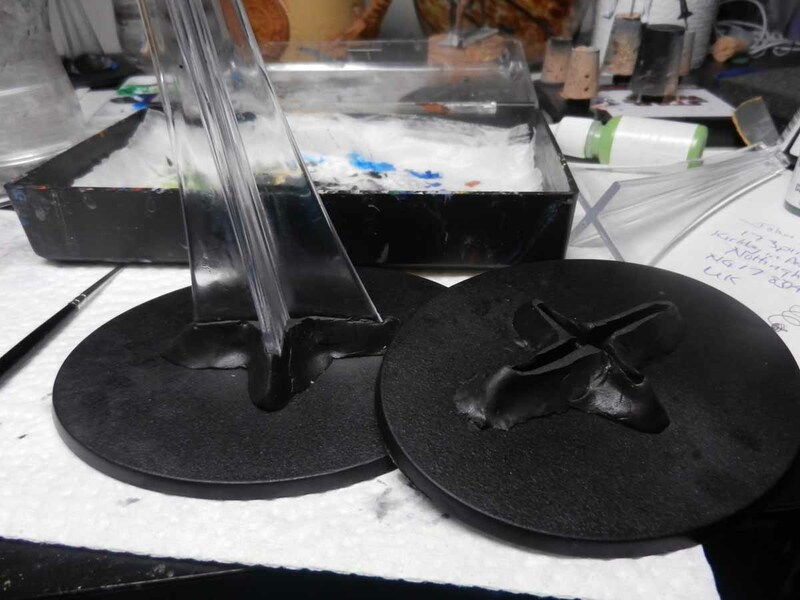 It doesn’t stick to plastic wrap or soapy surfaces very well so the first step is to use soapy water to lube up the plastic stands. 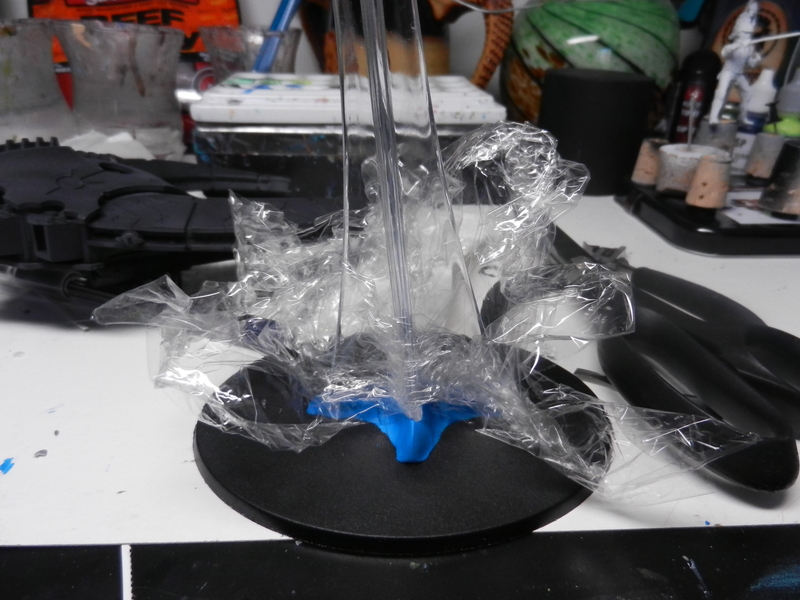 I did wrap the first stand in plastic wrap but it created a slight gap and left the stand a little unstable so I ended up using more Sugru to strengthen it. 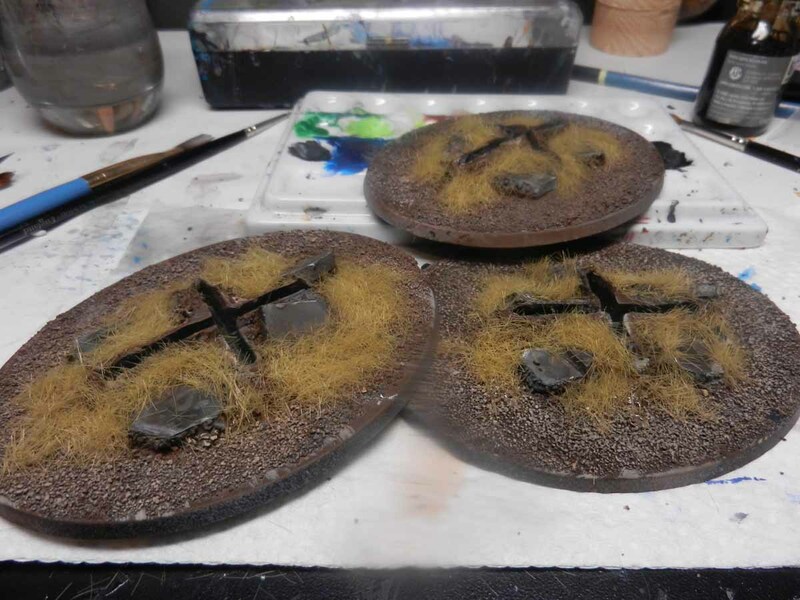 The other two I used the soapy water and it worked just fine. Â I’m sure that a little Vasoline or oil may work well too. After Â opening the packet, the putty just needs a little kneading and shaping. It does have a 24 hour cure time though so these can’t be done in a rush. 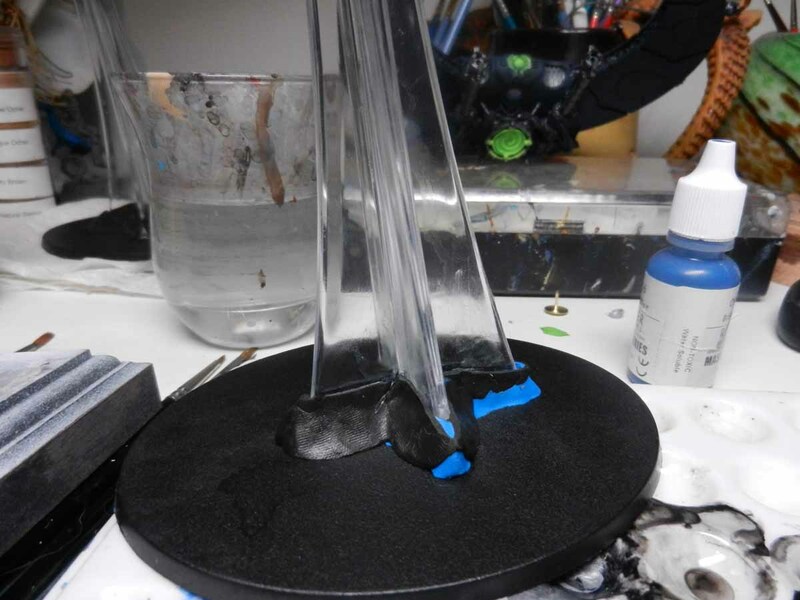 I put a little on the base and squished the flight stand in, making the initial shape of the holder. 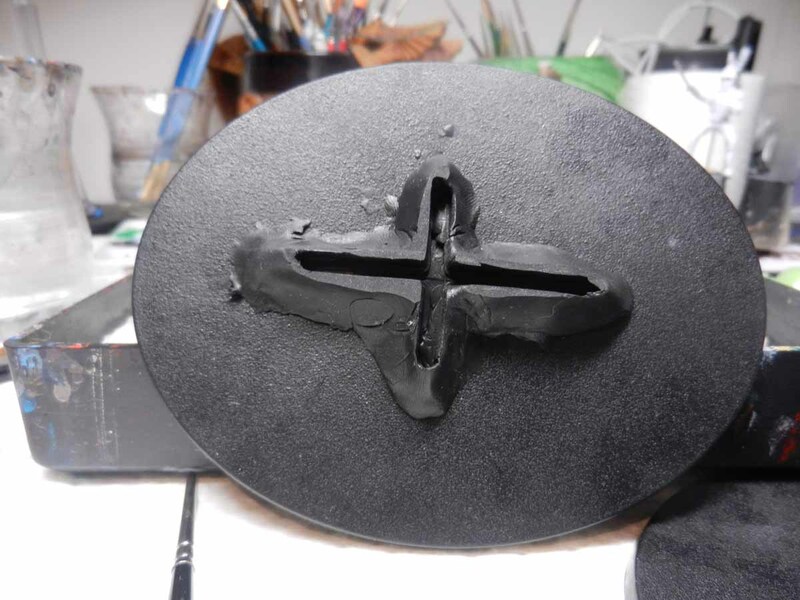 I then formed the Sugru up around the sides a bit. The picture below is the first experimental one. 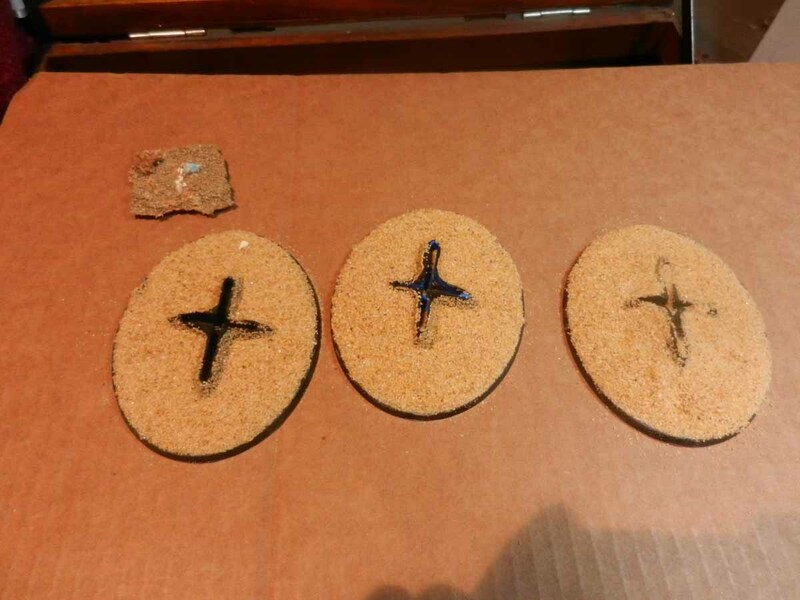 I ordered black Sugru that blends in a bit better than the blue for the other two. 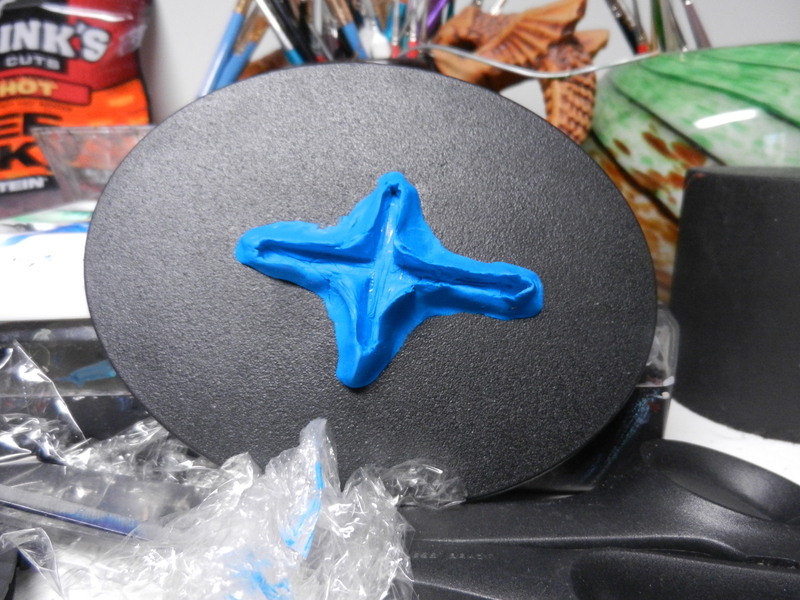 The Sugru will stick to the plastic base but not to the soaped up flight stand. 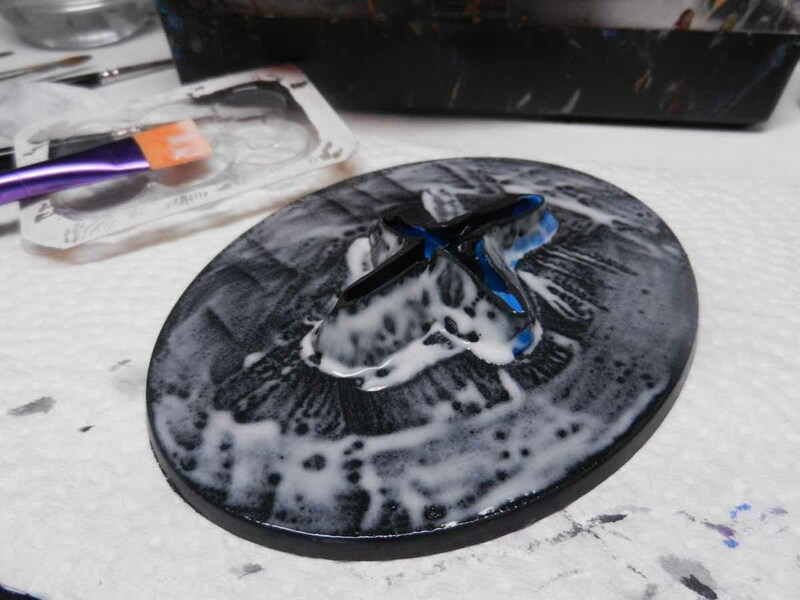 Any Sugru that does stick to the flight stand can be easily peeled and washed off. After the Sugru had cured, I cut down the thin high parts around the sides. 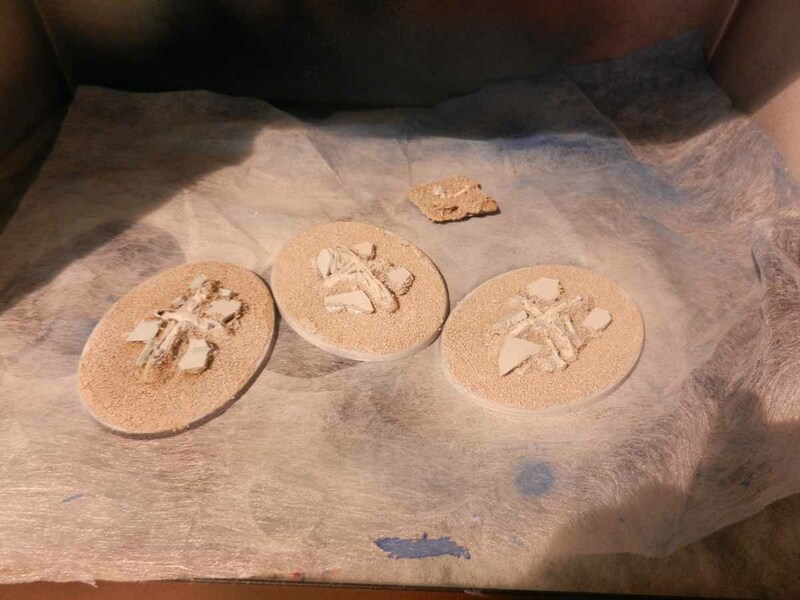 I added white glue to all three and submerged them in sand to start the groundwork. 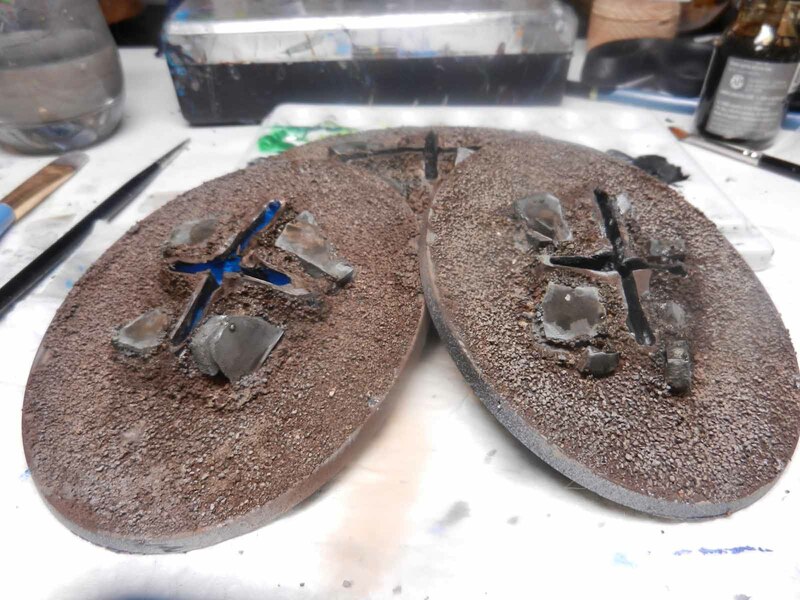 I use dental stone from work to make rocks, bricks, ruins, etc. 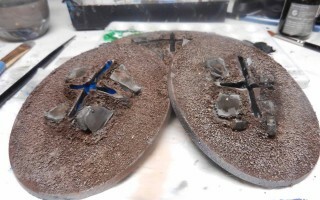 I placed a few pieces of rubble to help hide the Sugru and then added more sand. Sand is sure to get into the recesses but will come out with some help from an old brush. 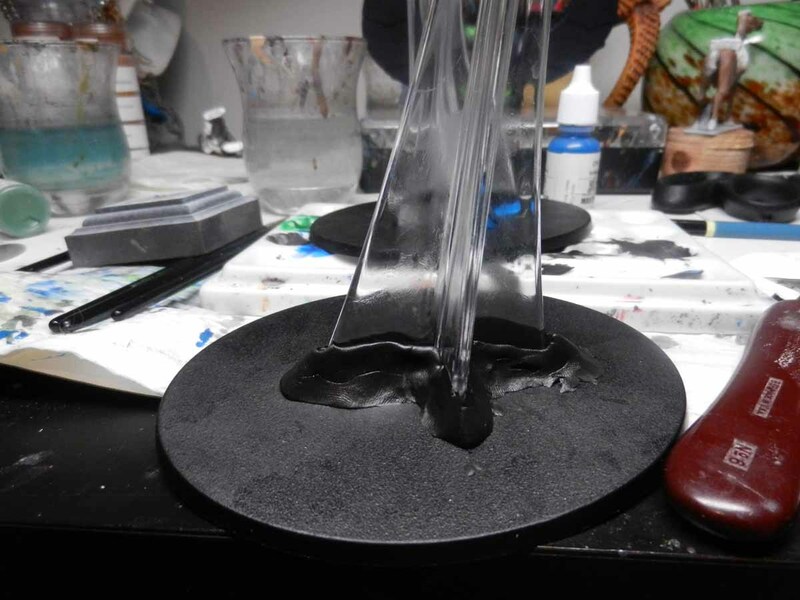 Into the booth they go for priming and airbrushing. I blocked out the form with damp paper towels. 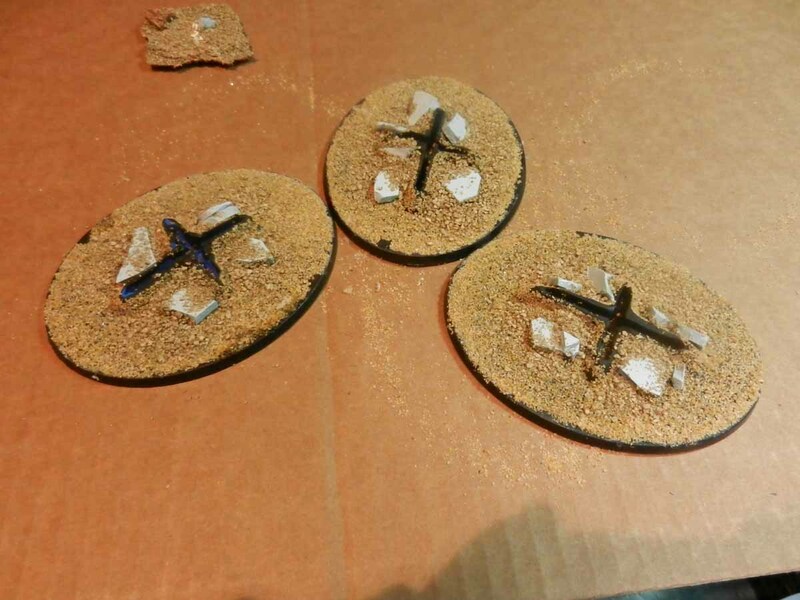 They’re easily retrievable after the paint dries. A little grass up the slopes further hides the flight stand holder. 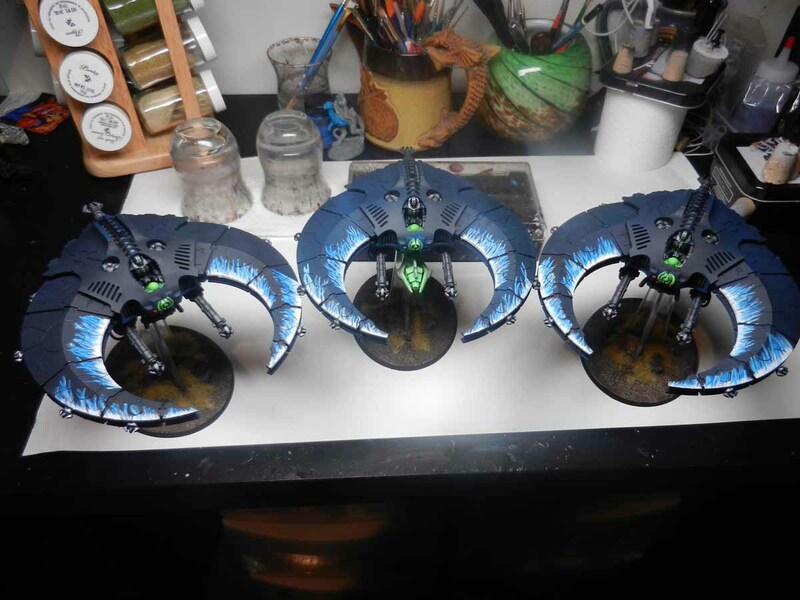 The Scythes without their stands. The Scythes firmly in place. 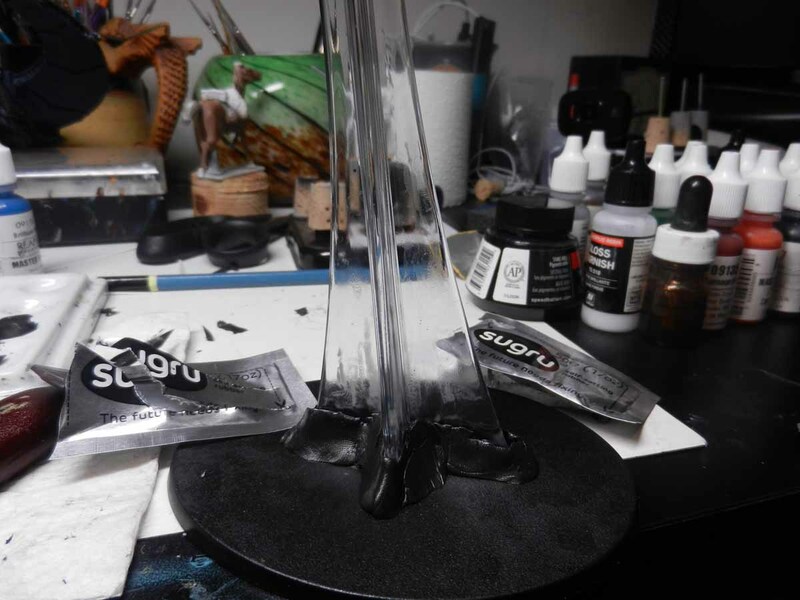 The rubbery consistency of the Sugru grabs the base of the flight stand so they are stable. 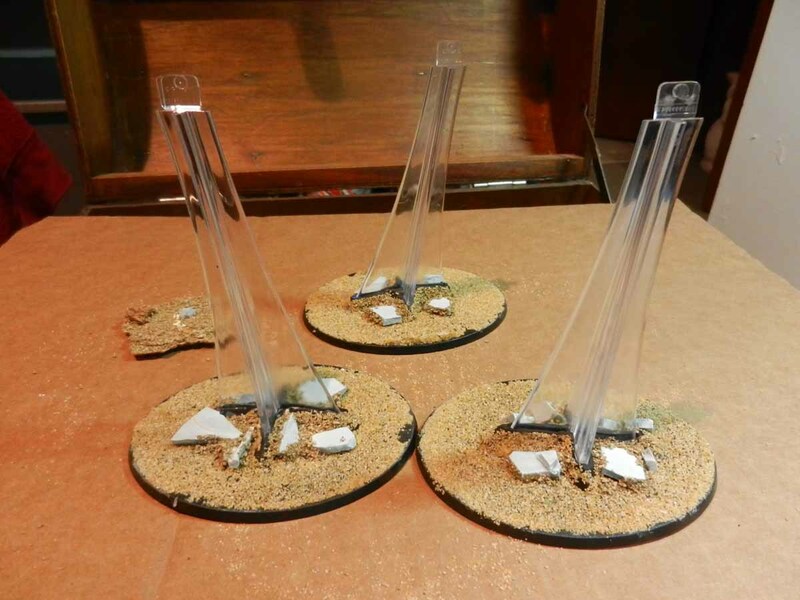 I’m sure there are many ways to make flight stands removable but I think this came out pretty decently. Now I don’t have to worry about the stands breaking during shipping and they will pack tighter in their transport case.